Honor 10i is official. Honor, the sub-brand of Huawei, has quietly introduced the new Honor 10i smartphone in Russia. Set to hit the stores in the country “soon,” the Honor 10i is a mid-range smartphone and comes with features like triple rear camera setup, 4GB of RAM, Android 9 Pie with EMUI 9.0.1, and octa-core Kirin 710 SoC. It joins the company’s other smartphones like Honor 10, Honor 10 Lite in Honor’s portfolio. Honor is yet to announce the price tag of the smartphone or whether the company plans to launch it outside Russia. Currently listed on Huawei store in Russia, Honor 10i sports a 6.21-inch full-HD+ (1080×2340 pixels) display with 19.5:9 aspect ratio and a waterdrop-style notch. The phone will be offered in three colour options. The Red and Blue variants will come with the 3D gradient finish on the back, whereas the Black will have a 3D finish without any gradient. 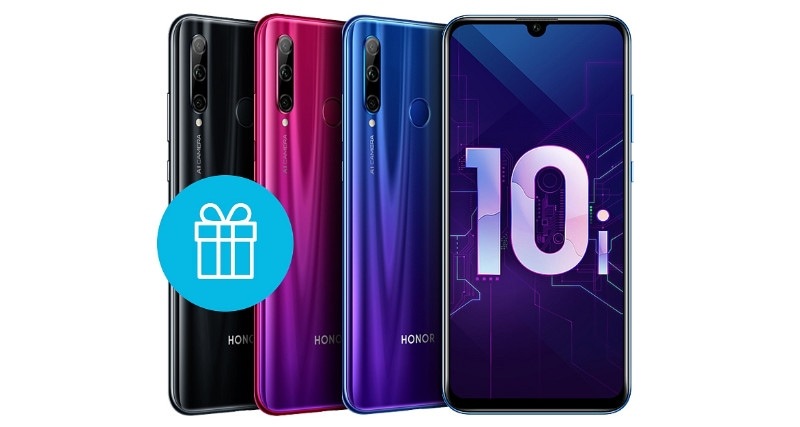 Honor 10i will be offered in three colour options. The phone is powered by octa-core HiSilicon Kirin 710 SoC and packs 4GB of RAM and 128GB of onboard storage. Honor has also included NFC, Face Unlock support, and Android 9 Pie with EMUI 9.0.1 in the smartphone. For the imaging needs, the Honor 10i comes with a triple rear camera setup, which houses a 24-megapixel primary sensor with an f/1.8 lens, an 8-megapixel secondary sensor, and a 2-megapixel sensor with an ultra-wide-angle lens. The company has also packed a 32-megapixel AI-powered selfie shooter on the phone as well. Among other specifications, the phone features 4G VoLTE support, a 3,400mAh battery, a rear fingerprint sensor, Bluetooth and Wi-Fi.